Al Gore at his worst? On the campaign trail, trying to appeal to the reasonable middle slice of the nation's population. Al Gore at his best? Chasing his passion as a warning bell doubling as a policy wonk, and doubling up on the charisma in the process. The smartest politician in America has rehabilitated himself, and he's coming for your electric grid. His plans for turning global warming around aren't perfect, but by dodging the American sacred cow (the almighty automobile) and chasing electricity production, Gore is able to generate a financially reasonable, politically embraceable path. His stated goal is replacing electricity generation by carbon-emitting techniques with zero carbon footprint sources. By contrast, others have called for the replacement of the hydrocarbon automobile and trucking industries by electric vehicles. Such proposals would have a very large tail wag a very big dog. We would have to junk nearly 300 million operating cars in the United States that of course use gas and diesel. (Even the few that do use some ethanol always use mostly gasoline, since ethanol cannot amount to more than a fraction of fuel in today's engines.) By making this move, we would place a very large new burden on the electricity-generating utilities and also need a revamping of the electricity distribution grid. And so indirectly and in a roundabout way those who call for changes in transportation end up where Gore has started -- focussing on the grid. It is in any case certain that in order to maintain and increase economic growth, Americans need an increasing amount of energy. The more efficient the energy -- that is, the cheaper it costs to create and deliver it -- the greater our economic growth is likely to be. The goal, then, is efficiency, with two conditions. We don't want to be dependent on foreign-controlled oil, because we want to escape the costly and dangerous foreign entanglements that are entailed and also because we don't want to be subjected to the upward-trending and apparently unpredictable pricing of oil in global markets. In addition, we want to abate carbon emissions, because we don't want to run the staggering risks that stem from global warming. The most direct way to achieve efficiency without carbon emissions or foreign dependency is a total overhaul of the nation's electricity generation and distribution industry. Not only are his messages bold in their very nature, but Gore is connecting the dots in a way the greater environmental movement has often failed to do. The three major problems facing Americans - economic decline, national security, and environmental degradation - are interrelated, he said. "We're borrowing money from China to buy oil from the Persian Gulf to burn it in ways that destroy the planet. Every bit of that's got to change." Mr. Gore, later answering questions from the audience, said he would not accept a role in the next administration. The best use of his talent and experience, he said, is “to focus on trying to enlarge the political space” within which politicians can address the climate crisis. He repeated the challenge he issued to the country on Thursday to produce 100 percent of its electricity from renewable energy and clean, carbon-free sources within 10 years. 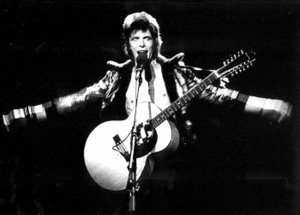 Recorded midway through his first ever U.S. tour, this concert finds Bowie and band (or rather Ziggy Stardust and the Spiders From Mars) to be tight, high on their own mythos, and crackling with energy; even when Bowie strips things to just himself and guitarist Mick Ronson on acoustic, they perform electrifying takes on “Space Oddity” and “Andy Warhol.” From the furious opener “Hang On To Yourself” through Hunky Dory classics and singles like “John, I’m Only Dancing,” they cast an incandescent glow the exact ruby hue as Ziggy’s mullet. If you just want a quick taste of the effervescent sounds of early Bowie, click here for streaming audio of that broadcast. Better yet, hang out and enjoy the whole show. Here's a hint -- the Internet is more powerful. Doug Wilder, not so much. That's an early look at Style Weekly's 5th annual Power List, which adds a few of our favorite faces to its running tally of people who move and shake our fair city in some of the right places. Hello, then, to our favorite TD columnist (And maybe the only one left! ), Michael Paul Williams; to the urban planner everyone loves to hate, Rachel Flynn; and to the founder of Richmond's Internet and his third cousin, iCommunity -- that'd be RVABlogs' Ross Catrow and his digital brotha John Murden. Those are a few of the new names on Style's radar, unveiled in the weekly's July 23 issue (out now, dwindling fast). There are 17 new faces on the list, including the four above. And to think, we knew them all when. But if the new faces aren't enough to get you excited, take a gander at the new Top 10 from the list. Bet you don't have Sunday brunch with these folks; in fact, going a step further, bet you probably wouldn't care to. Who? Yeah, that's what we said. Anyway, Trani and Wilder are heading for the cellar! Well, they don't have a stranglehold on the Top Five anymore. That's got to count for something. There's your breaking news for the day. If we have time, we'll dig into the horserace later. Tonight's meeting of the Richmond Planning Commission has been moved the City Council Chambers on the second floor of City Hall. The meeting -- where the commission is set to vote on the proposed Downtown Master Plan -- is open to the public, and slated to begin no earlier than 6:00pm. There will be no opportunity for comments from the public, but if you're free come on out and let the commission know you support the plan. We've missed Betsy Thomas, the winsome former proprietor of Betsy's Coffee House in Carytown (she sold our favorite hangout several years ago). Well, Richmond, Betsy's back. For 16 years, Dave Rennolds happily fed a lengthy line of downtown employees. In fact, it was a rare occasion - or post prime lunchtime - to not see a stream of people on the sidewalk outside Café Ole, at 2 N. 6th St.
That part likely won't change. But on July 1, Rennolds' life got a readjustment when he sold the funky little burrito haven to Betsy Thomas, formerly of Betsy's Coffee House in Carytown. Since you're probably counting the days -- seven, in case you weren't -- before the Old 97's bring their alt/pop/country/rock to Richmond, you're probably inclined to sit back and enjoy the band's singer, Rhett Miller, chatting it up and performing a few acoustic numbers on "Fresh Air." Alt-country favorites the Old 97's are as reliable as a worn pair of cowboy boots and an old flannel shirt. The band has been playing for 15 years now, and they just released the album Blame It On Gravity. Guitarist and vocalist Rhett Miller takes a break from their summer tour to talk about the group's new album and the band's career. Miller also performs some new songs and a few old hits. Over the past several years, the Times-Dispatch has dropped columnists, seasoned reporters and veteran critics the way a drunk drops poker chips in Vegas. Some losses have hardly put a dent in the paper's coverage, while others created gaping holes. Thankfully, some of those folks are either so financially strapped or so passionate about their craft that they continue to provide ink for the city's daily. Today, former full-time critic (now a "special correspondent") Roy Proctor continues to prove his value with two profiles -- one of the outgoing director of VCU's Anderson Gallery, and the second a profile of her replacement. Our schools are falling down around the children we are trying to teach. Potholes and unevenly patched stretches increasingly define our streets and avenues. You can see the river through the roadbed of at least one of our bridges. The city's drinking water and wastewater infrastructure is in need of a serious overhaul. Our acclaimed urban forestry program, which maintains more than 150,000 city-owned trees, is struggling to keep up. Overhead power lines are a primary feature of our landscape. The green infrastructure in the City of Richmond is non-existent. The issue of a decaying urban infrastructure is not unique to Richmond, but Richmond cannot afford to wait for a national solution. It is an issue that impacts all Richmonders, and an issue the next mayor should address. Tomorrow's meeting of the Richmond Planning Commission -- set to be held in the 5th floor conference room at City Hall -- may not be able to relocate, after all, despite calls from some groups. That's because City Council has called a special meeting tomorrow at 6 p.m. at City Hall to wrestle with its continuing budget dispute with the mayor. The City of Richmond Planning Commission will discuss further revisions to and consider adoption of the June 2008 Draft Downtown Master Plan on Monday, July 21, 2008. The meeting is open to the public, but there will not be a public hearing. The discussion on the Downtown Master Plan will be held at the end of the regular meeting agenda and will begin no earlier than 6:00pm. The meeting will be held in the fifth floor conference room of City Hall (900 East Broad Street).